Emma has just discovered that not only is she a Half-Breed, but her mother is a long lost mermaid princess. Emma herself is having trouble coming to terms with her identity because she feels torn between the human world and the world of the Syrena where Galen, the boy she loves, is a prince. When her mother reveals herself to the Syrena world, it nearly starts a war between the two kingdoms of Triton and Poseidon, and forces Emma to figure out where exactly she belongs. I am a huge mermaid fan, and I’ve been saying forever that there need to be MORE MERMAIDS!! There haven’t been many mermaid stories until recently, and I’m glad to see the increase in the appearance of mermaids in young adult literature. However, while I really loved Of Poseidon, I’m afraid Of Triton really didn’t do it for me. In the first book it seemed like there were so many sparks between Emma and Galen so I was really excited to see where the second book would take them. However, in the second book it seemed like there were no sparks at all! There were very few times in the book where Emma and Galen were actually together but when they were it was like there was absolutely no chemistry. I found myself really bored with their relationship overall, and I feel like they didn’t really even grow as a couple throughout this book. Emma herself seemed to be more childish in this book and weirdly kept calling herself out on her own immaturity. I felt like I liked her a lot better in the previous book. The narration of the story also bothered me a bit–Emma’s narration is told in first person and Galen’s is told in third person, which is just a really strange switch that didn’t really make sense to me. The overall plot was just so-so in my opinion. I found it hard to get through this book and it definitely took me a lot longer to read than I had expected. I think the lack of sparks between the characters and the somewhat blahness of the plot made it hard for this book to really hold my interest. Overall, Of Triton was a disappointing sequel to Of Poseidon. The sparks have died and the plot made this just seem like a filler book that is leading up to a (hopefully) more exciting third book. 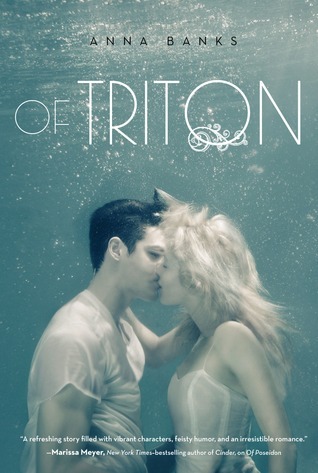 Of Triton was released on May 28, 2013 and is the second book in the Of Poseidon series. The third book, Of Neptune, is expected to be released in 2014.